Glaucoma is a pernicious blinding disease affecting millions of people worldwide. In some patients, the disease can be discovered early by measuring increases in intraocular pressure (IOP) – these patients are given hypotensive eye drops which can slow the progression of glaucoma. The real challenge has been, however, to determine the biological mechanisms through which increased pressure in the eye causes blindness. A group from the Moran Eye Center led by Dr. David Krizaj have recently published a paper in the Journal of Neuroscience which shows, for the first time, that stretching the membranes of retinal ganglion cells (which are the cells impacted in glaucoma), activates a specific ion channel which is permeable for the calcium ion. This increase in calcium influx through these TRPV4 channels made cells more excitable and, when sustained, killed them. 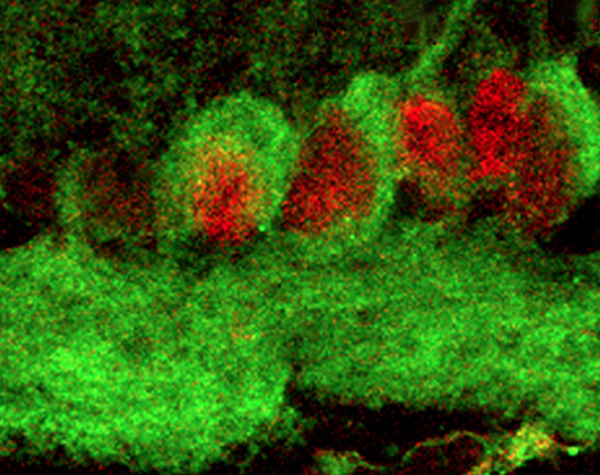 This is the first time that a mechanism has been identified that couples mechanical stimulation to biological signals in cells affected by glaucoma. Importantly, this discovery might clue us in why anti-IOP drugs help glaucoma patients as patients with particular TRPV4 variants may be innately susceptible to mechanical stimulation. The authors of this paper were: Daniel A. Ryskamp, Paul Witkovsky, Peter Barabas, Wei Huang, Christopher Koehler, Nikolay P. Akimov, Suk Hee Lee, Shiwani Chauhan, Wei Xing, René C. Rentería, Wolfgang Liedtke and David Krizaj.